Sweden is among the most wetland-rich countries in the world. The wetlands show a great deal of variability with fantastic biodiversity and cultural heritage assets. These areas are of value not only for wetland species but also to species from neighbouring ecosystems, and as resting grounds for migratory birds. The Swedish Environment Protection Agency (SEPA) is coordinator of the work to achieve the 16 national environmental objectives. One of them is ''Thriving Wetlands'' for which it is stated: ''The ecological and water-regulating function of wetlands in the landscape must be preserved, and valuable wetlands must be preserved for the future''. The habitat types of the Annex 1 mire series accounts for the majority of wetlands in Sweden. The method is designed to differentiate hydrological and physical impact of mainly anthropogenic origin on single wetlands from any general trends affecting wetlands as a group. This makes the results directly useful for evaluation of conservation status of the targeted habitats. In order to fulfill the national and regional environmental goals SEPA and the County Administrations need cost-effective methods that can produce comparable results at regular intervals. 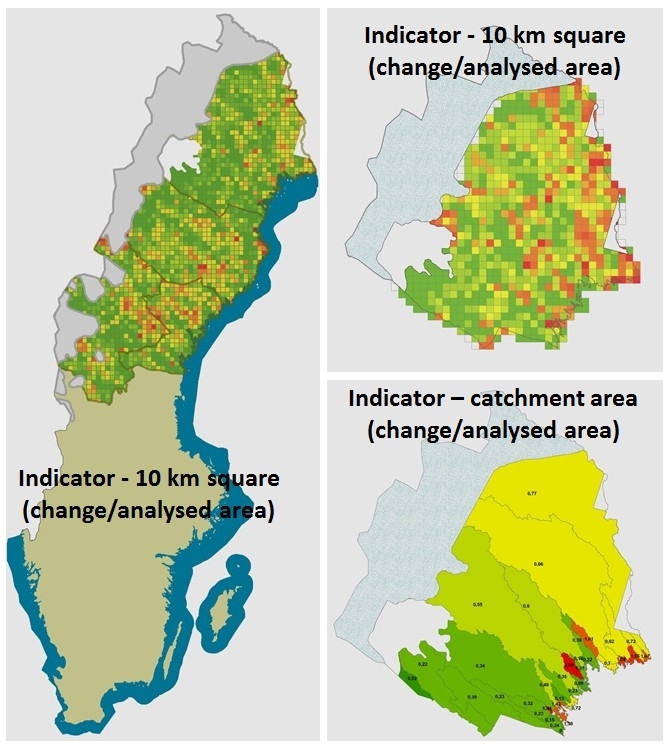 Together with our partners (SEPA, County Administrations) we have developed a satellite data based method for monitoring of Swedish wetlands suited for both regional and national levels. Since 2007 monitoring of the Swedish wetlands using satellite data is performed operationally by Brockmann Geomatics Sweden AB within the national environmental monitoring program (figure 1). Figure 1. Time schedule for first inventory coverage. 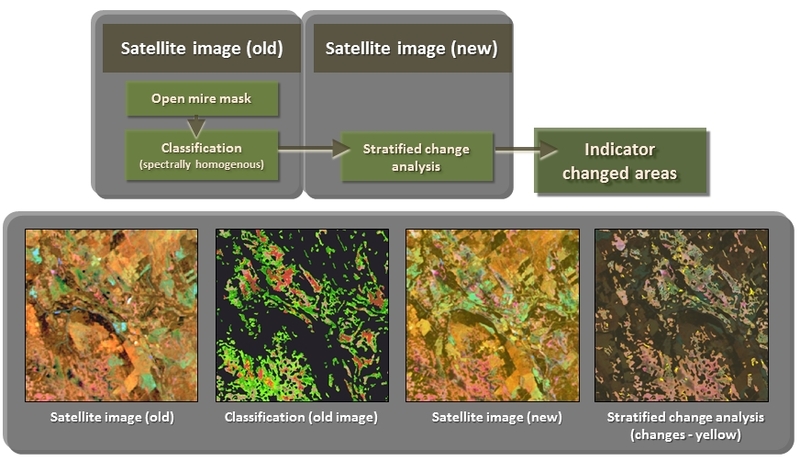 Input data for the change analysis consists of satellite data (Landsat TM/ETM) from two points in time (10-year interval) and the open mire mask from the Swedish Road Map. The satellite images should be recorded between approximately June 20 - August 15, with the optimal period being July. The developed method for detection of changes is based on a two-step approach. In the first step a detailed classification (based on the older satellite scene) of the mires into spectrally homogeneous units (~20 units) is performed. In the second step these mire units are used as masks for directed analysis of change within each mire unit (figure 2). Areas within each unit that has changed more than the unit in general are given a change indication. The indications for all units are then added together in the final result. The data that we provide in the operational monitoring are ''changes in the open mire''. Figure 2. Stratified change analysis method for the ongoing ''Operational Monitoring of the Swedish Wetlands''. In 2012 a new indicator for the Swedish wetland objective was proposed, based on the results of the first round of survey (figure 3). The 21 County Administrative Boards participate actively, facilitating the program with their regional expertise and using the data to evaluate progress towards corresponding regional objectives. Figure 3. Example of indicators for changes in the open mire.